This past week, I had the privilege of travelling with the Blue Ribbon Panel on Property Rights (BRPPR) as they continued their series of Town Hall meetings, this time, in south-western Ontario. To say that the meetings were profitable would be an understatement. The panel members are passionate about this topic and I can say that those who attended the meetings were equally engaged in wanting to “change the tone” to one of respect for property rights in Ontario. To understand what is meant by changing the tone, you must first have an appreciation for the value of those rights and how they have been eroded over time. We learned that property rights are a bundle of rights, including human rights. We also learned that without these rights, we lose our freedom and prosperity. The panel clearly demonstrated that here in Canada, we do have rule of law and a system of property rights supported by law. However, those laws are being disrespected and inappropriately applied. The panel heard time and time again about how people have lost their faith in government to protect their right to use, enjoy, and profit from their property. Bylaw officers and government agents feel free to trespass on private property without a warrant, to write up charges on the strength of one anonymous complaint, and to drag out a court case until the accused is financially, physically, and mentally bankrupt. We heard of instances where property was effectively taken without compensation. “If we have no rights to our land, then why do we have expropriation law”, said Tom Black, who challenged the audience to provide solutions for restoring respect for property rights. The question of changing the tone on property rights is not simple. The answer is not more legislation. Perhaps it is education. Perhaps it is a change in the culture of the public service to one that recognizes that providing a service to people is better than trying to control them. 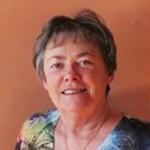 What if government were to ask “Will this bill/bylaw hurt someone; will it reduce their right to own, use, and profit from their property, does the potential exist that someone could lose their property (car, house, land, animals) without compensation, what purpose is served by this bill/bylaw”? The meetings were hosted by Toby Barrett, MPP Haldimand Norfolk (in Langton), Sam Oosterhoff, MPP Niagara West-Glanbrook (in Lincoln), and Bob Bailey, MPP Sarnia-Lambton and Monte McNaughton, MPP Lambton-Kent-Middlesex (in Petrolia). The Chair of the BRPPR is Jack MacLaren, MPP for Carleton-Mississippi and a long-time supporter of property rights. Do you have an idea or two on how to improve property rights in Ontario? Have your say at www.YourPropertyRights.ca. Note on the photo: Langton, Ontario is the only community in North America named after Stephen Langton, Archbishop of Canterbury. The Archbishop was a key figure in the presentation of the Magna Charta by the barons to King John in 1215. The Magna Carta is a foundation document containing protection for property and human rights. 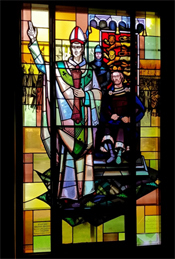 The stained-glass window showing Stephen Langton presenting King John with the Magna Carta, pictured above, can be found at the Sacred Heart Roman Catholic Church in Langton, Ontario.